Immerse yourself in the natural wonders of North Central Florida with Five Star Trails Gainesville & Ocala, a comprehensive guide to the best hikes in a region that includes the Ocala National Forest and the Cross Florida Greenway, both compelling outdoor recreation destinations. Discover urban places for reflection such as Sholom Park, a carefully manicured woodlands in a retirement community, and Bivens Arm Nature Park, where ancient trees stand sentinel above a marshy extension of Paynes Prairie in a busy section of Gainesville. Explore the vast longleaf pine flatwoods and sand pine scrub forests of the Ocala National Forest along the Florida Trail, and discover the deeply shaded swamp forests of Goethe State Forest near Dunnellon. See more alligators than you’ve ever seen in your life in the home of the University of Florida Gators along the La Chua Trail at Paynes Prairie State Park. 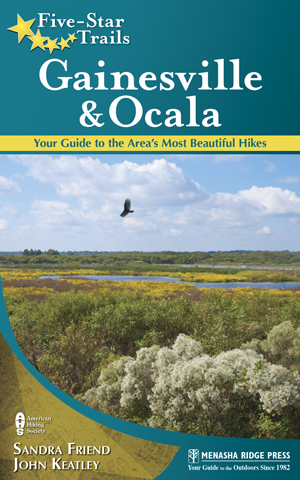 John and I explored nearly 50 hiking trails within an hour of both Gainesville and Ocala before settling on the ones we included in this guidebook. We think you’ll enjoy following in our footsteps. PLEASE NOTE: The dog policy in the Ocala National Forest has changed since publication of this book. Dogs are no longer permitted at Juniper Springs Recreation Area except at the campground. Paperback, 266 pages. Kindle edition available.